She's the woman you share everything with. 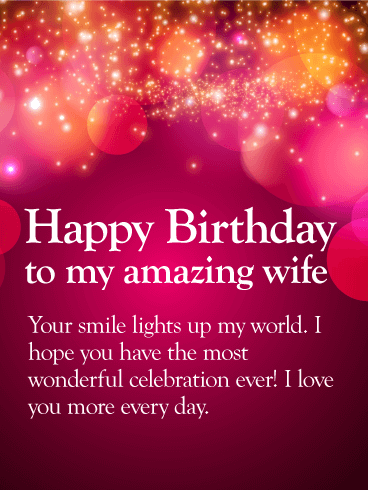 The one who you love above all else and the person who makes your life complete. 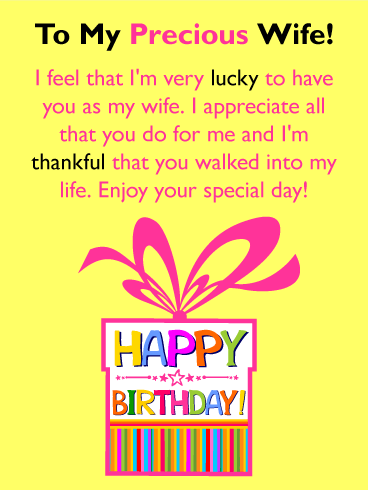 On her birthday, let your beautiful wife know how you feel with this lovely birthday card. 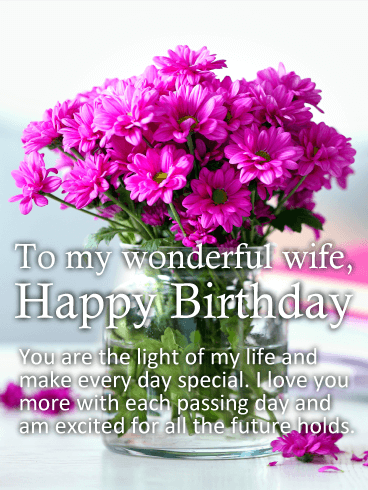 A sweet pink background with charming little yellow daisies sets the perfect tone for the sentimental words below, which will touch her heart on her birthday and all the days ahead. 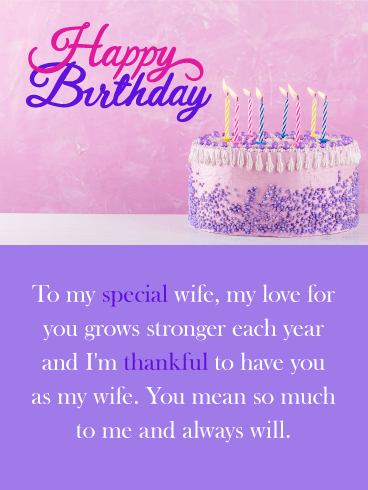 Brilliant bursts of color will help you celebrate your wife's birthday in an unforgettable way! 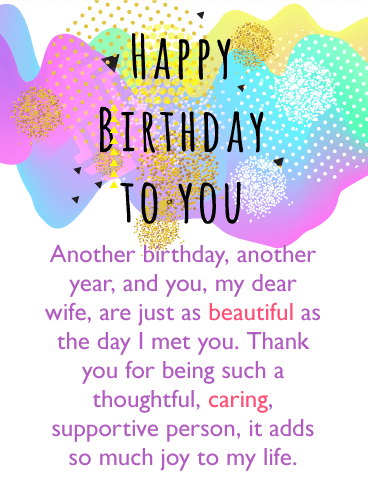 This colorful birthday card brings your best wishes for a day she'll always remember while reminding her how much you love her and that you can't imagine your life without her in it. 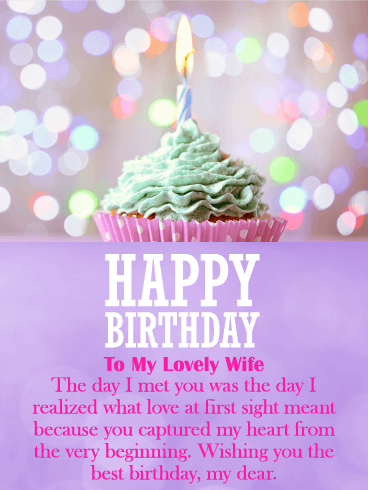 What a wonderful way to make her feel loved and remembered as she turns another year older. 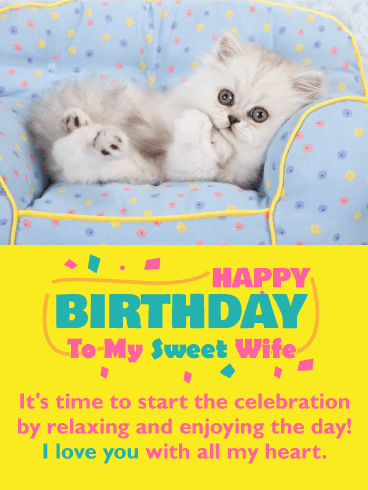 Golden balloons, streamers and confetti set the scene for an amazing birthday celebration your wife will always remember! 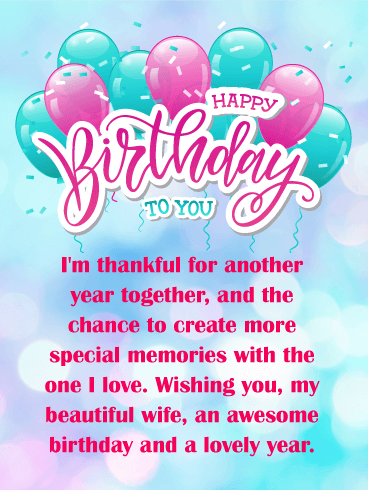 This festive birthday card is a great opportunity to tell her everything you feel, and to wish her a day filled with the people and things that make her happy. After all, nobody deserves it more. 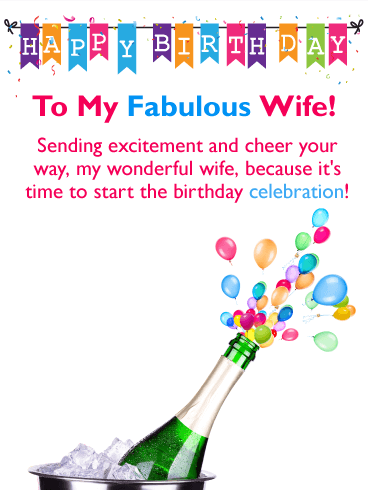 Your wife will be excited to celebrate her birthday when she sees this festive birthday card! 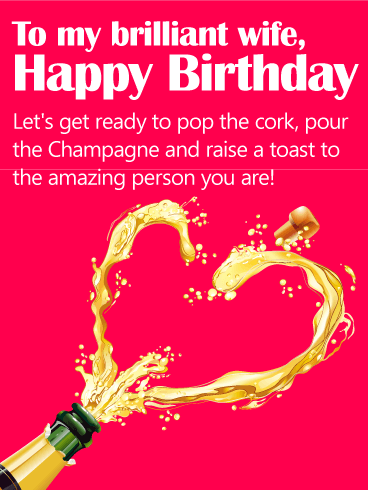 Featuring a Champagne bottle-the cork popped to reveal a beautiful heart-along with your own meaningful words, it's a wonderful way to raise a toast to her on her special day while also reminding her just how much you will always love her. 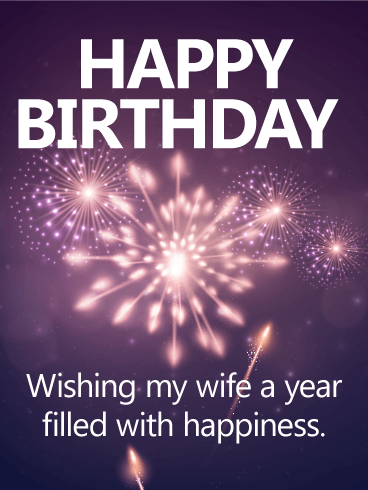 Fireworks light up the night sky on this gorgeous birthday card, which will help you wish your amazing wife the biggest and best celebration ever! 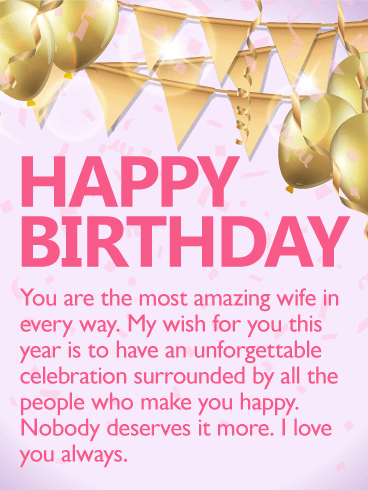 Beyond her birthday, you hope the year ahead for her is filled with happiness, because she is the most special person in your life and your love for her is beyond compare. 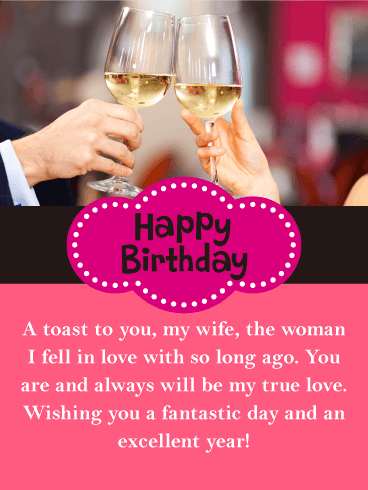 Your wife's birthday is here again...the perfect time to raise a toast and let he know you're wishing her a wonderful day and year ahead! 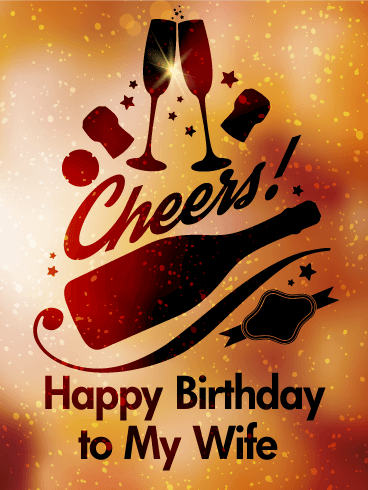 This brilliant birthday card features a glowing amber background accompanied by two glasses and a bottle of Champagne, creating a festive setting for her special day while letting her know how much she's loved! 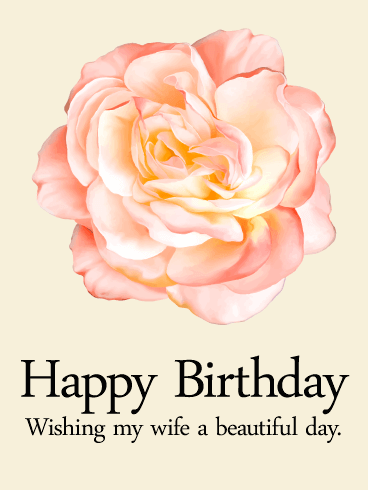 Your wife will be excited to celebrate her birthday when she sees this flower printed pretty birthday card! 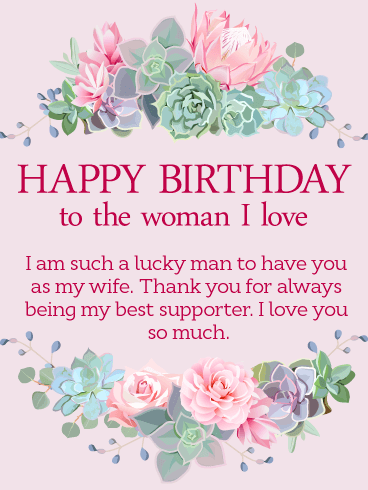 It's a wonderful way to let her know how beautiful she is on her special day while also reminding her just how much you will always love her. 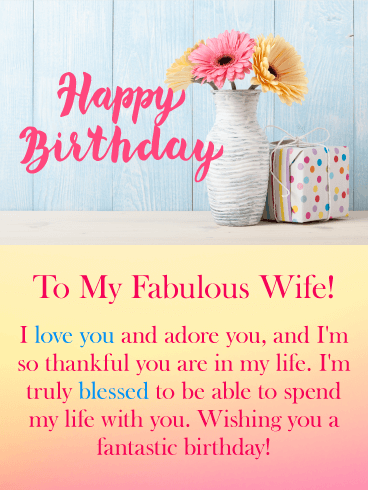 Sending this beautiful birthday card is the perfect way to remind her just how much she's loved. The charming rose creates an even sweeter sentiment for the woman who you care about more than anything. 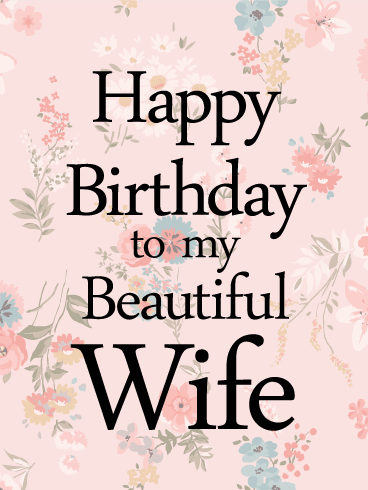 Wish your beautiful wife a beautiful day. 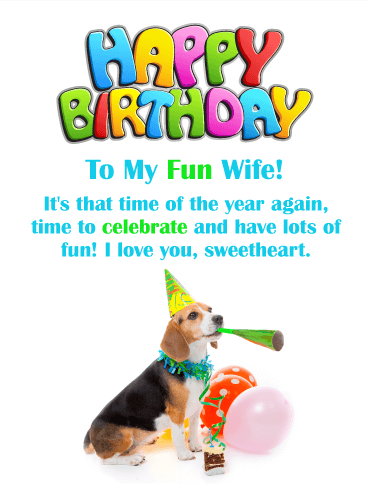 This lovely birthday card for your loving wife will put her in the mood for a memorable celebration! The gorgeous flowers will let her know how sweet you think she is. 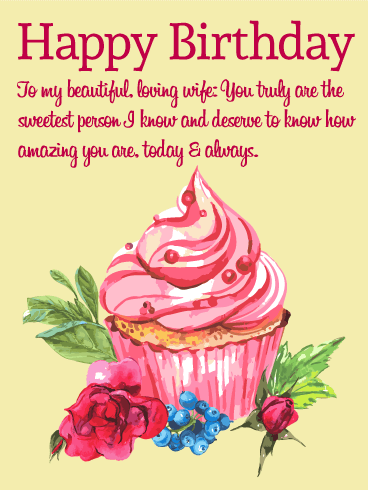 Let your wonderful wife know how lucky you are to have her as your wife with this gorgeous birthday card. 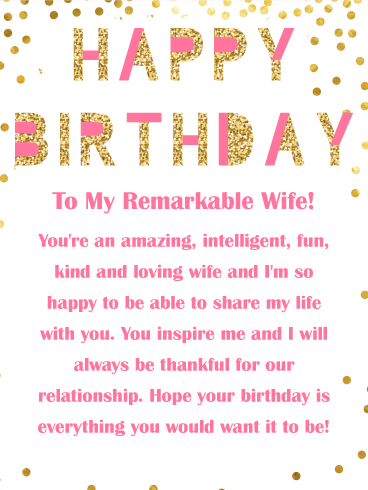 There's no sweeter woman than your wife! 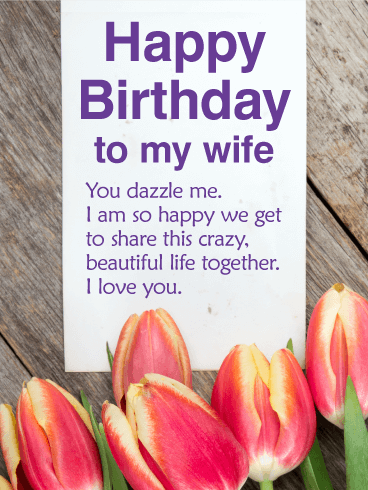 This charming birthday card is the best way to let her know! 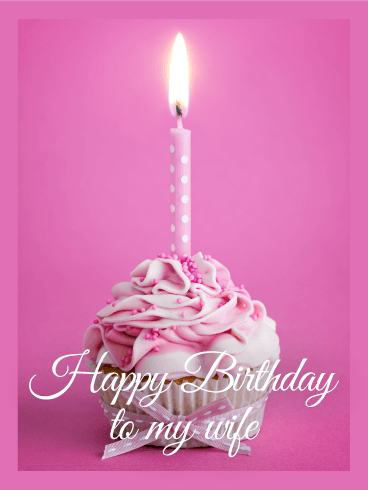 She will surely love a pink cupcake that has pink sprinkles on it and a pink polka-dots candle. You don't need much to say to her because she already know how you think of her. 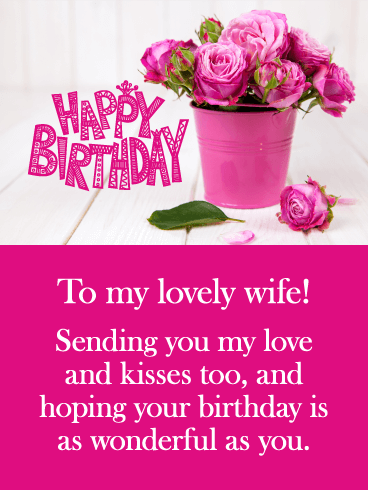 Send this simple but pretty pink birthday card to your amazing wife. She's the woman who make your days with her bright smile. 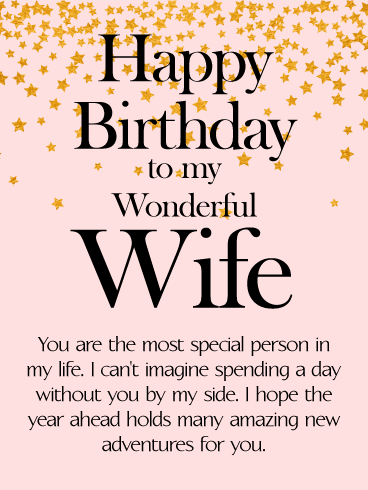 The one who you love above all else and the person who makes your life complete. 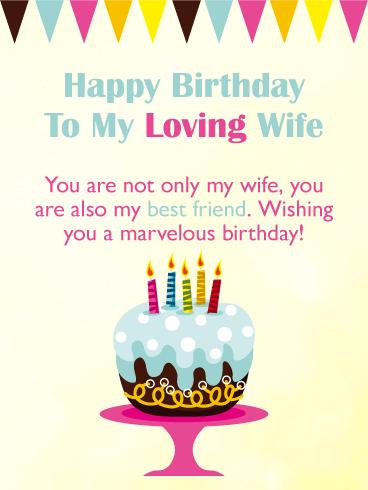 On her birthday, let your cheerful and charming wife know how you feel with this fun birthday card. 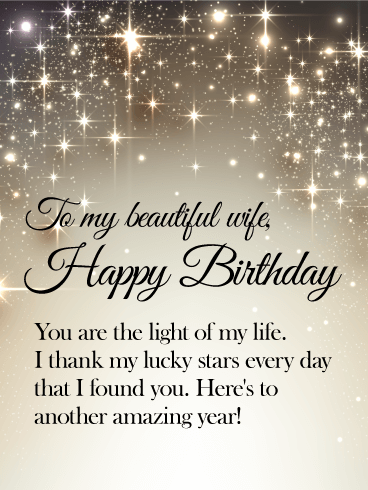 Another wonderful year with your beautiful wife. 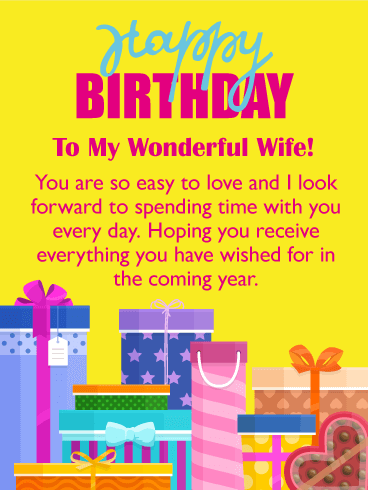 Make her feel loved and cherished this birthday with a thoughtful card. 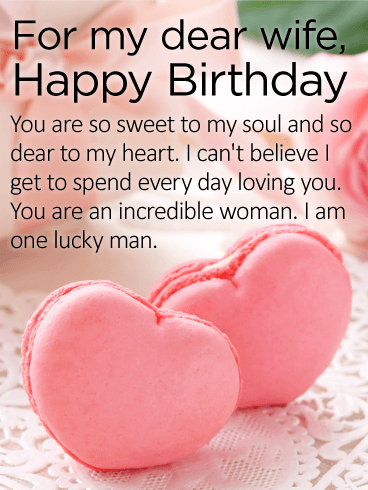 Sweet sentiments are felt by the heart and remembered forever. 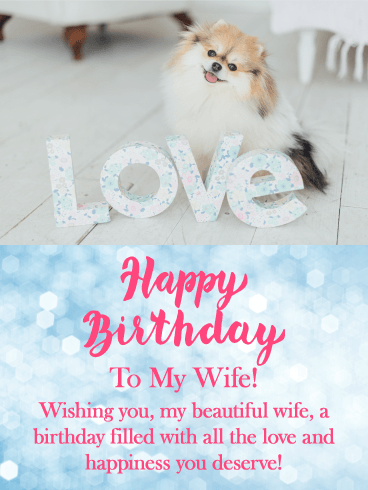 Send a birthday greeting card to your wife-it's simple, fast, and easy, but more importantly, it expresses your love for your wife in more ways than one. 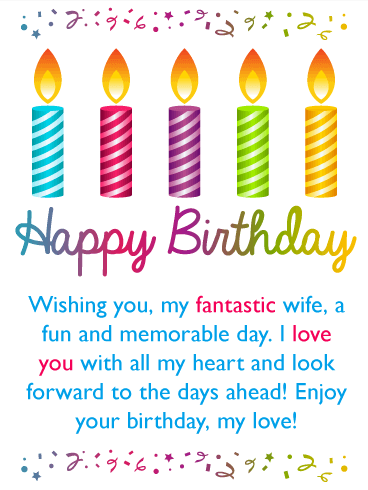 Let her know you treasure her and send a birthday greeting card today. 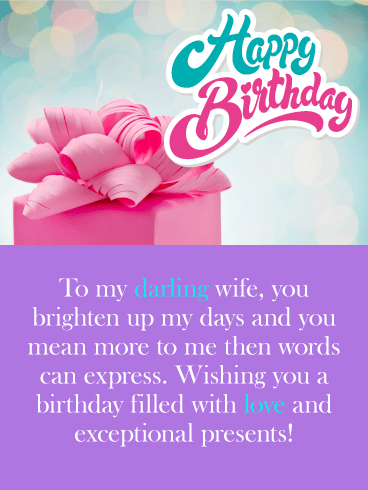 Send sweet words to your wife on her birthday. 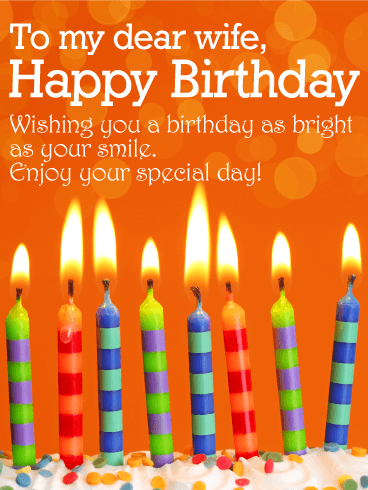 Don't miss the opportunity to send a thoughtful and beautiful birthday message. 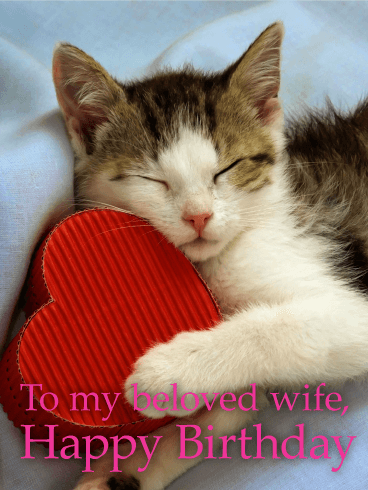 Your wife will love the heartfelt words and pretty card. 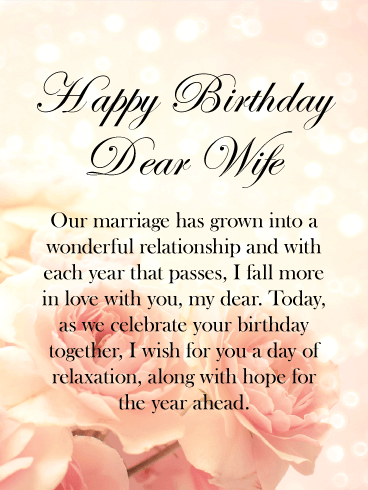 Your wife's birthday only comes once a year, and is a perfect day to spoil her with extra love and attention. 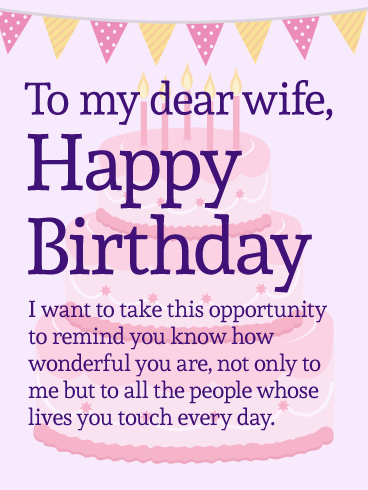 A birthday card is just the thing to make her day extra special. Send one now! It's fast and easy. 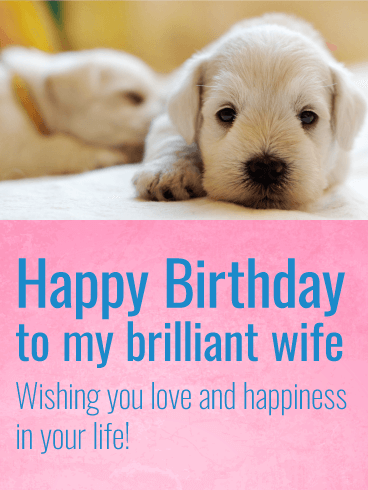 Give your wife exactly what she wants for her birthday! Romantic gestures, sweet nothings, and words of affirmation. She always wants to know how much you love her. 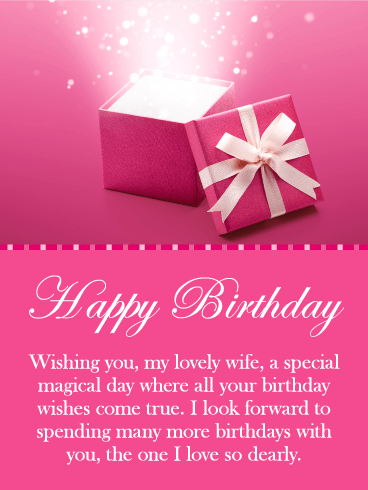 Tell her so with our gorgeous birthday greeting card. They say it all for you with one easy click! 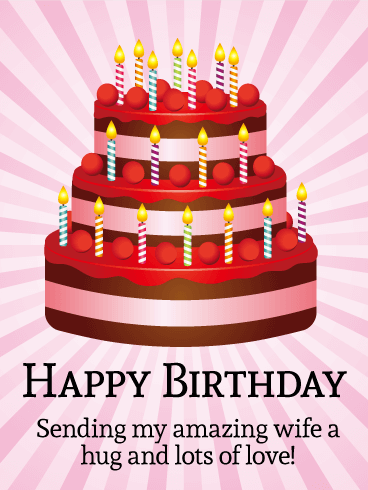 Send your wife a birthday card today. You might not be the best with words, but we are. 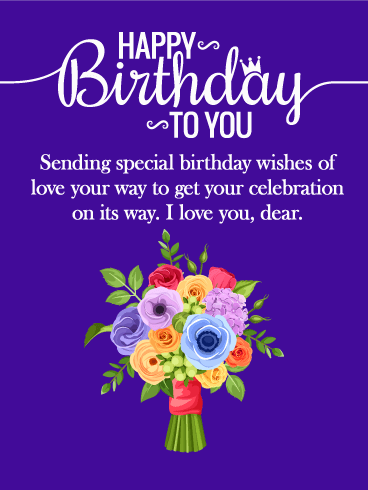 Share your heart with her and send a romantic birthday card.